And it leads to the mystery of a long-gone runaway! Mei can never catch a break from mysteries! With her tea shop now open and living her dream life married to Yasahiro Suga, she’s just trying to avoid bad luck and live a normal life. But when a friend shows up asking for help with an old missing person’s case, Mei can’t resist the pull of a mystery unsolved. She knew the young woman who went missing and had always wondered what happened to her. Now’s her chance to find out, even if it turns long-time Chikata residents against her. While Mei is working at the tea shop and helping with the case, she’s also assisting her mom on the family farm. Convincing her mom to renovate the old house is not an easy task, and Mei is continually frustrated by her mom’s lack of enthusiasm for the project. Until Mei’s brother shows up and wants to buy the business out from under her, betraying Mei and Yasahiro in the process. Can Mei find the missing woman and keep her reputation intact? And will she and Yasahiro repair their relationship with Mei’s mom before it tears their family apart? 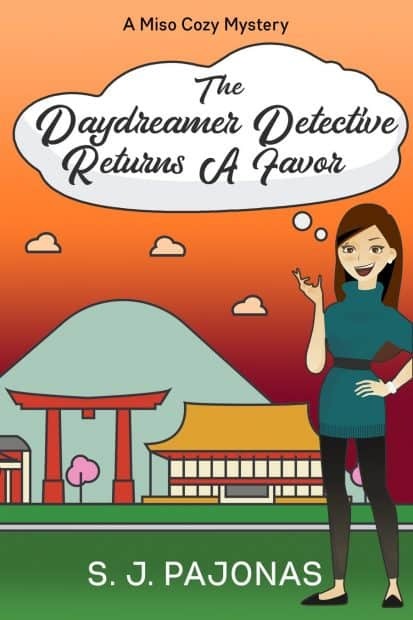 With her head in the clouds and a taste for solving crime, you don’t want to miss Mei in The Daydreamer Detective Returns A Favor, the surprisingly rich fourth course to the Miso Cozy series of cozy mystery novels. “So what’s on your mind? What do you need my help with?” I expected her answer to have to do with an elderly parent or aunt or something of that nature. If there was anything I was known for now, it was taking care of the older set, and I was proud of my achievements. I loved my mom, despite our fight earlier in the year, and I loved the family farm, too. I would do anything for her. But I didn’t want to be known as a farmer. That wasn’t my destiny. This was. “It’s complicated. 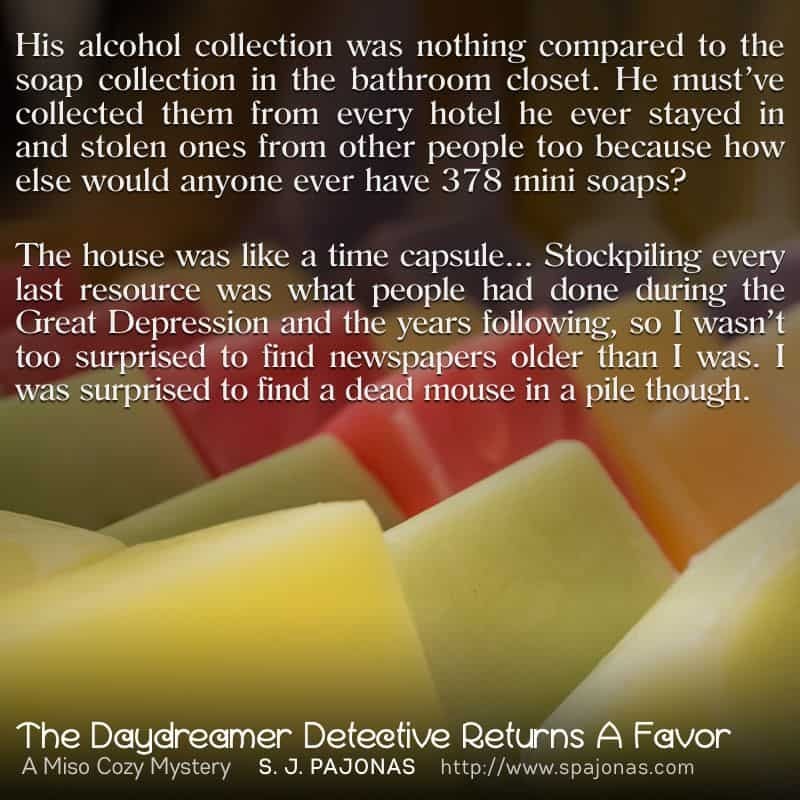 Did you know I’m only about five years older than you, and that my family goes back in this town for several generations?” She dried a teacup, being careful to wipe the porcelain down thoroughly before setting it on the shelf next to the others. “No. I didn’t know that. 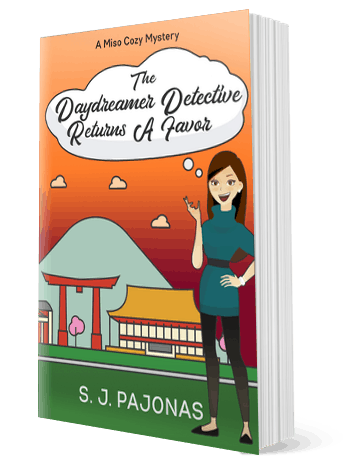 Did we go to the same high school?” It was the same high school I had visited last year during the investigation of Akiko’s father’s death. Ria Fukuda was Chikata’s biggest mystery. Forget the deaths of Akiko’s father or Etsuko or Amanda. The disappearance of Ria plagued our town for many years. One day, she had been laughing and playing with her friends at a town festival. The next morning she was gone. No note. No indication that she was unhappy and had run away. Nothing. The search went on for weeks, and her parents pleaded with town residents endlessly for help. They never gave up on her, even when all her friends had moved on to college and their adult lives. Even when their younger sisters and brothers had done the same. I smiled as I remembered how Ria had always spent time with us even though the older kids found the little kids annoying. I raised my eyebrows at her as I washed the last teacup. Akai sighed, her shoulders dropping. “It’s not as great as you think. The man was a hoarder, and now I have a fire hazard of a house on my hands, and contracts for network security work are piling up on my desk. I want to get the place cleaned out and on the market before the end of the year, but I don’t think I can do it myself.” Her voice quavered, and my heart constricted. Akai wasn’t one to show emotion, and here she was talking to me about them.